Add a new workflow functionality. More flexibility in settings. 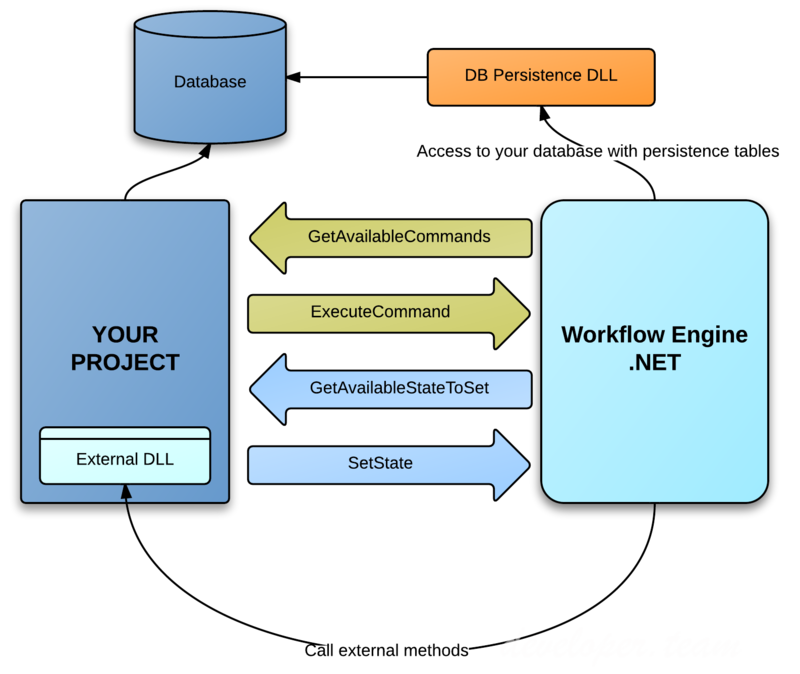 WorkflowEngine.NET is a component that adds workflow functionality to your application. It can be fully integrated with the application, or be implemented as a specific stand-alone service (such as a web service). The product provides a completely web-based designer that enables your business processes full visual modelling. All you need is a HTML5-friendly browser. Before getting started with the Designer, you are strongly recommended to understand the essence of the each block displayed on the picture. Create Actors, Command, and Timers. Create the first Activity marked as “Initial”. Create Activities, in which the document can move from the current Activity. Link the current and new Activities with the help of Transitions. 4.1. In the State field – the name of a document’s status. 4.4. Fill in the Action calls in the boxes “Implementation” and “Pre-ExecutionImplementation.” Methods from the “Implementation” box will be called, when the document moves to a respective Activity (in “Pre-Execute” mode, methods from the “Pre-Execution Implementation” box will be called). If you use the constructor functionality to build a concordance history, then you need to add the appropriate methods in the data blocks (in our example, these are UpdateTransitionHistory and WriteTransitionHistory, respectively). 5.1. Indicate the value of the Classifier. Use “Direct” or “Reverse” for direct or reverse Transitions, respectively. 5.2. In the “Restrictions” block, indicate Actors with access rights for this Transition. When several Conditions are indicated, they are grouped by AND. This function is available for Trigger type equal Command. 5.3. In the “Triggers” block, indicate the type of operation (as per p. 3.5) that initiates a Transition. 5.4. In the “Condition” block, indicate the type of Condition (as per p. 3.5) that helps define the possibility of a Transition and choose an appropriate Transition Type. Create Parameters and indicate them in the appropriate Commands.